In the beginning, there was 90.4 Oman FM. I remember driving around in my rented Mitsubishi Lancer and invariably getting completely lost every time I tried to find something and had the lovely people on Oman FM to help me through my latest quest to find.... Lulu's. It was nearly Ramadhan, and the radio presenter, some Australian/Indian sounding lady was running a quiz of nursery rhymes on air. I seem to recall she was in Salalah for the Khareef. People were calling in to try and finish the nursery rhyme to win a prize. And rather amusingly, if they didn't complete it properly, this woman would berate them, sometimes even calling these people stupid, and then never actually tell us the answer! I thought it was hilarious, in a cruel twisted way, but honestly, I would just be driving around, totally lost with absolutely no idea where I was, but would be laughing at the absolute ruthlessness of this radio lady. My most favourite moments would be when she cut people off that were chirping because she said something like, "no, you got it wrong stupid!" and half way through their defence they get cut off. hahahahaha. Evil lady, I loved it! Along with the fascinating news jingle (still in use today I think) and the amusing 30 seconds to 5 minutes of random dead-air, I felt thoroughly like I was destined to finally give in and buy an ipod. Now I should mention here that I'm totally anti-apple. Why? I'm not really sure, I just don't like them. And that's really all the excuse I need not to like a product really. And then one day I heard that there was a new radio station coming to Muscat. I hit auto-search and it landed on 95.9, and, in full stereo was Avril Lavigne's Girlfriend. It was October 2007, and there was a new Phantom DJ on the radio waves. They played modern music, it sounded clear and in stereo, and there was no classical music on it! Score! Enter Hi FM. It was the end of January, 2008 when they finally launched, under much fanfare here in Muscat. I think purely because they broadcasted their signal properly (and thus in stereo as opposed to mono) and they had real native English speaking DJ's and played a style of music that was not trying to satisfy everyone in the country, it very quickly built a large audience, leaving poor old Sultanate of Oman radio in their wake. It wasn't all rosy though, Hi FM made mistakes (Rachey Roo) and I certainly had my fun poking Darren Shortt on this very blog at the time. To their credit, Oman FM 90.4 has gotten better - they don't have any dead-air these days, and they even play dance music in the evenings sometimes. And everyone in the city now had a new, comparably decent, radio station to listen to that played modern music, and lots of it. Quite why Darren insisted on playing Scooter so much I've never really understood. I like to think that someone deleted all of the Scooter tracks from the Hi FM music computer one night, and I'm glad we don't have to hear Scooter any more! 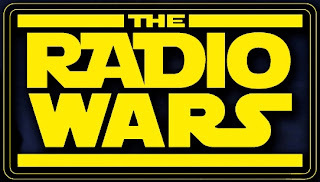 In terms of Star Wars (my theme here...) Hi FM became the Galactic Empire, Sultanate of Oman Radio 90.4 became the Ewoks and were left to play in their tree village with their friends. The Galactic Empire were dominating the radio waves, playing whatever they wanted and living happy in the knowledge that they were on top. But, the winds of change started to blow once more. LOL!! Sythe.. you're definitely exaggerating the berating, but all well the motley crew on 90.4 are a silly and scary bunch. ..so, did you find Lulu?? who would buy those iPods / gadgets if our FMs imitate the likes of Dubai or Mumbai:) chill folks! To the first anon - no idea what her name is, but I've heard her reading the news from time to time. Terry - no way man, I remember sitting in a parking lot outside of a home centre just cracking up at this woman. It's almost like she hated her listeners. As far as the "repetitive, boring" comment, which just happens to start with the word "Hi", I should imagine that there are laws that are being, shall we say, tested? You dont see Newspapers trash-talking each other here, because there are laws against it. 2nd Anon - I was drawn by the flashy lights, like a moth to a light. I was actually looking for my office, but ended up at Lulu's. I frequently ended up at lulu's when looking for other places. 3rd Anon - I dont know! looking forward for the new radio station to join in! I worked on both stations, Oman Fm was rough and ready and cheap with no direction, still has none but they all did their best. I tried to do my bit but was binned for giving them more work to do, (damned advertising). Hi Fm was fun, again a good station with well intentioned presenters, music was a bit soft but has got better recently. Shame they were not prepared to spend money on presenters and shows but they all do a job and well enough. The new station will be a mix of music, maybe not to all tastes but it will suit many. The presenters I think are strong but time will tell, personal tastse etc. I like the choice we now have, reminds me of helping to set up Channel 4 in 1996, a revolution at the time. With all due respect to Anon above, the music and presenters whom I know most of in UAE are much better than here, but Oman is new in this market and I wish all the guys on all the stations the best. Most people do not realise that the music is pre programmed and not the choice of the presenter, crap wages and insecurity for all of them puts a lot of pressure on these guys and girls. i for one am glad we have a choice and no matter who you like or dislike it is not as easy as you think. Nice to see people care enough to chat about it here, well done M.M. I think the name of the Oman FM presenter you are thinking of is June Lewis! Excellent post! I was about to write something myself about how miserable the Omani information media are...and your observations on this are bang on! Not sure what you're comparing HiFM to though...differently awful but equally I would say! Re. Oman FM though, I think it's an oversight to miss "Zawan in the Morning" from your reminiscences. World music at 6am? Aaaaagh! Anyway, like you I am looking forward with (probably misplaced) optimism to having another choice. When is the launch date for the new one? Great article! I'm new in Oman, and basically all I do is listen to the radio and go online, since we dont have a television yet. I checked out both the radio stations you are describing. I agree95.9 is a great station, yet I think that the australian lady- June Lewis and Charlie Kaieks- An American/canadian lady, i think are very good and talkative. I have been to Lulu's, I'm still learning the roads though, it was so much easier driving in the evenings during Ramadan now its just so rushed!